"Barhot" well, is a sleeping legend in the vast wilderness of the Barhut Valley in Hadramout, Yemen. It’s said to be the most hated spot in the earth to God, and from it will be the destruction of the world ... and It has the worst water on the planet. Barhout Valley is a desert valley located in the region of Figuet in the province of Al-Mahra. There is a large hole in this valley that extends to more than 100 square meters, and descends to the dark bottom of more than 250 meters. It is like a well but it is not made by humans. 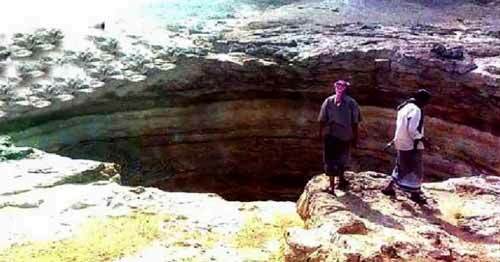 Some say that it was the Jinn who dug this deep hole for one of the kings of the Himyarite who ruled the region in the old time to hide his treasures. 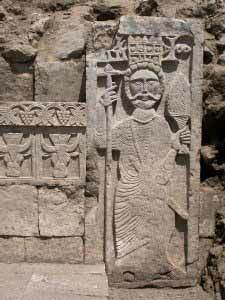 Others believe that it was dug up to be a jail for the jinn who came out of control. The inhabitants of the region have many strange tales about the well, one of which tells us that in the past people have been through a period of severe drought, so they tied a man with ropes and slowly lower him into the well to bring water. When he reached the middle of the well, He screamed in terror to lift him. When they raised him, they found only half of his body. They are also talking about a sheep shepherd who put her baby near the well, and the child disappeared in the blink of an eye. There is a Hadith of the Prophet Muhammad that says: "The best water on the face of the earth, Zamzam water, and the worst water on the face of the earth, water in a valley in Hadramout named Barhout its water is black and stinky"
From personal experience I tell you now: I have performed compulsory military service in a camp near the area.. In the desert of the Empty Quarter. There was an ordinary well dug to provide the military site with water. But when the pump started working for the first time to withdraw the water, a black liquid came out of the well like tar.. The smell was unbearable.. Bad smell like rotten eggs.. I was nauseated by the severity of the smell. . It is certain that this well is connected to the same source that feeds the water of Barhout well and contains the same characteristics.. And it is actually: (the worst water on earth).